Because we spend a third of our lives in the bedroom, it makes sense to make it as relaxing as it can possibly be. Unfortunately, we also treat our bedroom as an oversized storage bin, chucking almost everything we own, from clothes to books to personal mementos, in here. What we need to do then is to "create a bedroom environment that is both relaxing and configured with ample storage space for all those things we use the most," say the authors of Common Sense Storage: Clever Solutions for an Organized Life. And we're not just talking about closets. "Bedroom storage options don’t stop at the closet. Shelves, pegs, hooks, baskets, and chests are just some of the organizers that can help bring visually appealing order to the bedroom," says C. J. Petersen, author of Organized Home: Stylish Storage Solutions for Every Room. 1. Open closet. Make your bedroom more open and less stifling by ditching the closet doors. "Storing clothing out in the open also makes decorative elements out of your textiles while making them easier to retrieve," says Petersen. 2. Maximise vertical space by installing hooks and pegs on your wall to display your jewelry, belts, and other accessories. 3. Platform bed. Staying in a cramped bedroom? 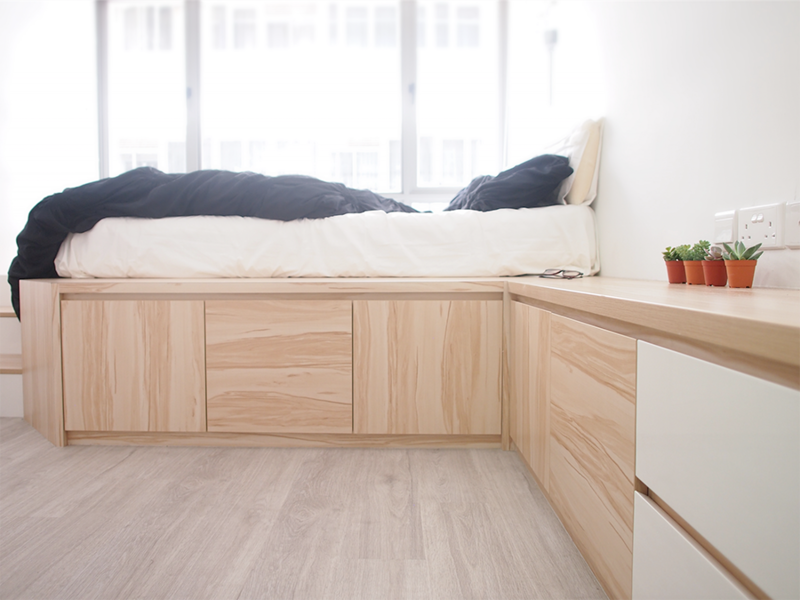 Solve your space woes with a raised bed that's equipped with under-the-bed storage drawers. Ask your contractor or designer to do it. 4. Built-in storage around the bed. Limited square footage gives you an excuse to have built-in shelves and cabinets installed around your bed. 5. Closets with sliding mirrors. Visually double the size of your bedroom with a mirror that slides to reveal shelves and closet space. 6. Multi-level room with staircase storage. Maximise the vertical space in your bedroom by building a loft-style bed that comes with staircase drawers. The extra space underneath the sleeping area can accommodate more boxes and floating shelves. 7. Vintage suitcases. Hide your bedroom clutter in vintage suitcases and pile them together to create a nightstand. Decorate accordingly. 8. Smart bed with built-in storage. Look for a multifunctional bed that's equipped with a pull-out bed feature, built-in shelves, and a pull-down writing or laptop desk. 9. DIY pegboard. Display artworks and store your accessories and fashion staples with a pegboard. 10. IKEA storage hack: Mount TRONES cabinets to your bedroom wall and use them to stash different items.